I have zero recollection of not having comic books. They have been an important part of my life literally as far back as I can remember. I started showing up in family photos wearing Spider-Man and Batman shirts when I was three. When I wore my Ben Cooper Batman costume to kindergarten for Halloween, I discovered my best friend in the class had the exact same one. Naturally we were close friends that year, but his parents moved before first grade. For years I thought the Falcon's powers stemmed from accidentally getting sucked through a strange tornado. This was because a friend of mine down the street had the Mego figure and, having never seen the character before, I asked who he was. The explanation he gave was imaginative, certainly, but hardly accurate. My first encounter with the Fantastic Four was via Marvel's Greatest Comics #91, which reprinted Fantastic Four #111. I absolutely hated it because everyone was mad at everyone else, and one of the main characters died at the end. Ironically, I later started collecting Fantastic Four beginning with #254 precisely because one of the main characters dies at the end. My first letter was published in Fantastic Four #318. I won a No-Prize in it. I still have my old video game record log. My best time for the Atari 2600 Superman game was three minutes flat, recorded on April 4, 1987. My previous best time was 3:15 from June 16, 1985. My introduction to many classics of literature was through comic book adaptations. My mental visuals for 20,000 Leagues Under the Sea, Dr. Jekyll & Mr. Hyde and Treasure Island come directly from comic versions. I decorated my high school locker with the original Teenage Mutant Ninja Turtle action figures when they first came out. I also taped up Berkley Breathed's first Outland comic up when that was printed. 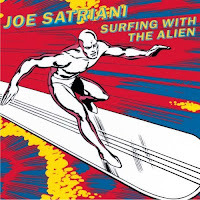 I started listening to Joe Satriani's music exclusively because the cover to his Surfin' with the Alien album features the Silver Surfer. Although it was a friend of mine who made a tape of it for me; I didn't actually buy the album. I did buy Can's Monster Movie for the Galactus cover, but didn't care for their music. My senior "thesis" in high school was a history of comic books. Although the bulk of it started with The Yellow Kid, I noted even then that it was an artificial starting point and it should really date back to cave paintings if you wanted to follow it in its entirety. I got an "A" on the paper. I think I still have a copy of it somewhere and should post it here sometime.